They mailed it — that’s what took so long! You’d think that with the stench of sewage in someone’s basement that there would be a little bit of urgency on their part. What’s a little fuzzy mold, right? Anyway, the quote is $527.74. And we’re going to do accept it. See, this isn’t something we really want to delay. The odor is rough, putting it mildly, and I’ve come to the conclusion that no matter who we choose, I still won’t be 100% satisfied by the price or the quality of work. I’m not completely certain that $527.74 is a great price. In fact, I’d bet I could do the work myself while spending just $80 in materials at Home Depot or Lowes. But at this point, I just want my house to smell fresh and clean again. 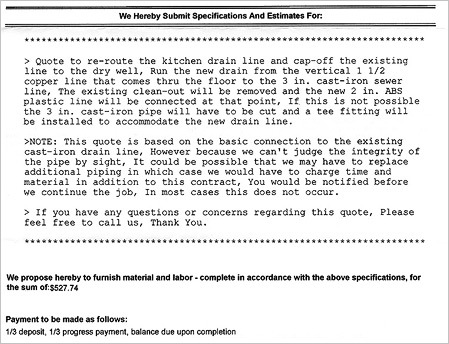 Sooner rather than later and that’s why we’re not going to solicit additional quotes.